I had no sooner written my blog about my new well-thought-out Three Ring Circus Modus Operandi, when I discovered that I would soon have to expand it. Easter with family, as well as unexpected activities seemed to expose some cracks to my best laid plans. I have long known that "life is what happens when you make plans", but I did forget to factor this into my new modus operandi. I don't give up that easily however! 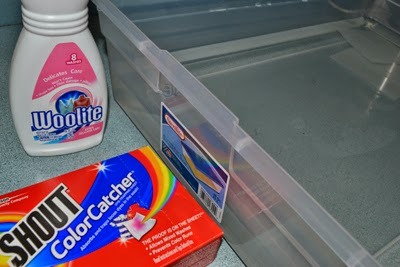 Trying Woolite and Shout Color Catcher to hand-wash wall hanging. Forgetting the other details of my life wasn't the only oversight in my plan to become better organized and productive, it seems that any change has a ripple effect and the response isn't always so fun! Change at my house is often met with resistance in others. 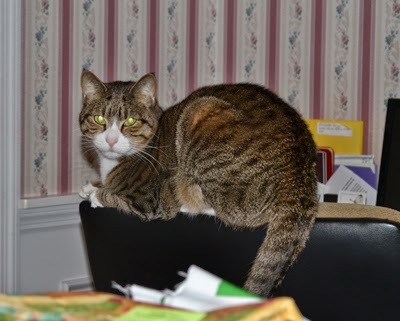 Even the cat and dog seem to want to re-stake out what they consider to be their territory! Hand-washing worked to remove glue worked well! Zeldie, my cat, normally sleeps on my sofa or on the back of my vacation chair and now has taken to my ironing station chair or rolling on my freshly-vacuumed living room floor, that I have blocked off to keep clean, so I can iron my quilt tops and keep them free from any dog hair, but my cat sheds worse than the dog and the spaces I have recently cleared seem to fill up with my family spreading like melted butter across a plate, sucking up any new space I have created!...And don't you know that even my own body seems to have taken on a course of its own suddenly demanding rest when I am super motivated to get projects done instead!! Added rings to my new Modus Operandi.I forgot to factor in my leader, Zeldie. No matter that my goals and plans are now off-schedule, I am going to "go at it again" and be a bit more discrete about it! 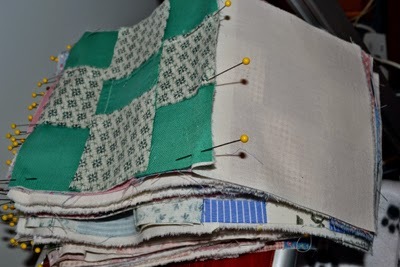 My will is "set like flint" to get my sewing goals done, no matter that already my project completion dates are already off by several weeks! I do see much progress and I remind myself that nothing is perfect! 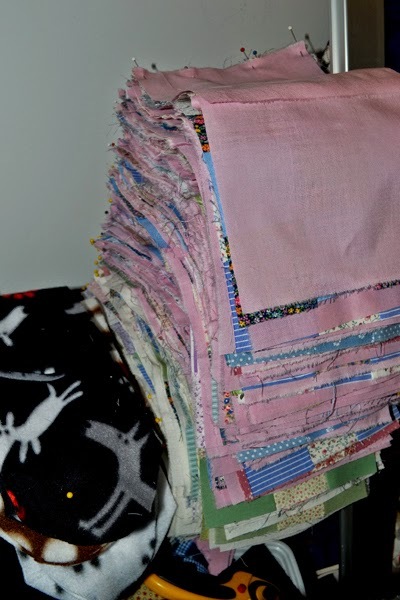 I remained focused on my goals to finish my unfinished quilts plus create still more. 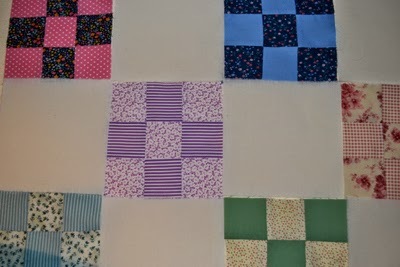 It is hard to keep a good quilting woman down!! 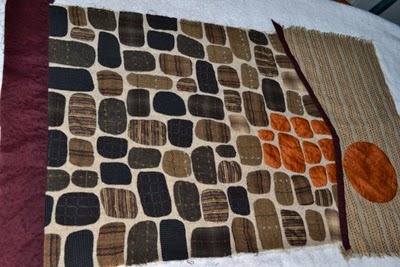 Used my hand-made insulation board with flannel to lay out 9 Patch blocks. 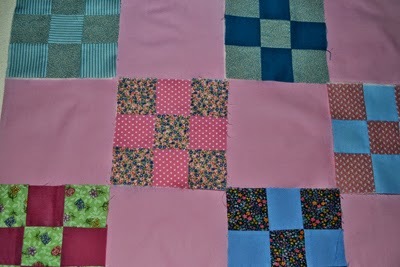 Enough 9 Patch blocks left over to make another top using rose versus muslin. Fleece socks cut and ready, along with 2 quilt tops, all pinned to sew. Labels: Three Ring Circus Modus Operandi needs more rings; Sewing organization and efficiency plans show "cracks"; Progress continues!